All C1 asked Santa for was a froggy in a tank. C1 believed Santa would bring him one and Santa, at the very last minute, made sure a frog was under the tree on Christmas morning. The first thing C1 did for Herbie was to make a sign with his new frog's name. (I named Herbie before C1 saw him.) You can see the tape and the white oval that makes up the sign in this picture. Our cat Simba thought the frog, the little gray blob at the back of the tank on the left hand side, was hers. Fortunately the tank has a wire mesh cover! The tag on the tank said the froggy is a red spotted frog. 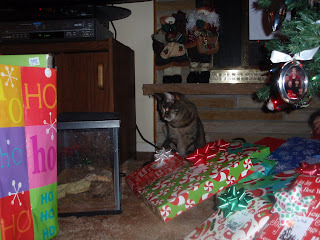 She though Herbie was very interesting while he was under the tree. However, she hasn't visited Herbie up in C1's room where the frog now lives. As for my son, he was more skittish at first than our usually skittish Simba. 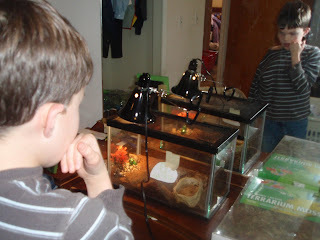 He looked at Herbie from across the room, but eventually was able to get closer as you can see from the first picture. Late in the day, I asked C1 if he was scared of the froggy or if he liked him. "No I love Herbie," he said. 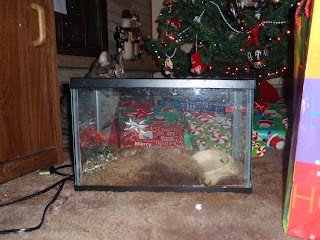 When asked by relatives on the phone what he received for Christmas he would say, "I got what I wanted--a froggy in a tank!" Although he did receive some other gifts, he only talked about Herbie. Sounds like Herbie is a great hit! Well done Santa!! Awesome! I bet Herbie is a real cutie. We have never had a frog. EnjoY! Well ... living in France, married to a French man, with three half-French children, I can only say "Long Live the Frog"!!! !